George Armstrong Custer was born on December 5, 1839 in New Rumley, Ohio to Emanual Henry and second wife Marie (Ward) Kirpatrick Custer. His father was a farmer and blacksmith in rural Ohio. His mother was a widow and brought several step-siblings to the marriage. Emanual likewise had children from his first marriage. In addition to George, his full brothers included Thomas, Boston and Nevin as well as sister Margaret. His father named Custer after George Armstrong, a minister, with the hope his son would join the clergy.<?xml:namespace prefix = o ns = "urn:schemas-microsoft-com:office:office" /> His mischievous nature and a taste for alcohol proved otherwise. George spent much of his boyhood living with his half-sister and husband in Monroe, Michigan. He graduated from Hopedale Normal College in Ohio. George helped to pay for his board and room by hauling the coal for the school. He graduated in 1856 at 16 and subsequently taught school in Ohio. However his lifelong dream was to be a soldier which came true when he was appointed to the Military Academy at West Point in 1857. His tenure was rocky. He came close to expulsion several times due to excessive demerits, many from pulling pranks on fellow cadets. He finished at the bottom of the 34 graduates in 1861; its numbers lessened by many loyal to the South who left to join the Confederate Army. Ordinarily such a poor performace would result in an obscure posting and career, but the start of the Civil War created a sudden need for new Union Army officers. He received a commission as a second lieutenant in the 2nd Cavalry. He served on the staffs of Generals George McClellan and Alfred Pleasanton, distinguishing himself on dozens of occasions. On <?xml:namespace prefix = st1 ns = "urn:schemas-microsoft-com:office:smarttags" />June 29, 1863, he jumped rank from 1st Lieutenant to Brevet Brigadier General as a result of gallant conduct at the engagement at Aldie on June 16, 1863. At 23, he was the among the youngest US military generals in history. He and his future wife Elizabeth Clift Bacon met in 1862 while both lived in Monroe and in the midst of the American Civil War. She fell deeply in love with him but her father refused to allow them to get married. Judge Daniel Stanton Bacon doted on his daughter, and hoped for a better life for his child than as an Army wife to a man beneath her station in society. 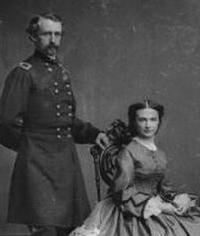 After Custer was promoted to Brevet Brigadier General, Judge Bacon finally relented and they were married on February 9, 1864. "Libbie" was the only officers' wife to live in a tent on the edges of the battlefield, ride in the ranks with the soldiers, and accompany the 7th Cavalry on expeditions. Custer was assigned command of the <?xml:namespace prefix = st1 ns = "urn:schemas-microsoft-com:office:smarttags" />Michigan Cavalry Brigade which he led in the Gettysburg campaign. His signature "Custer Dash" maneuver is credited as both reckless and brilliant. He continued to fight with distinction, earning the rank of Brevet Major General at age 25. But as most wartime promotions, these senior promotions were only temporary. 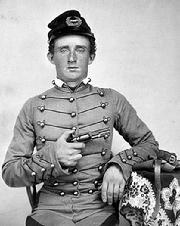 Once the war was over, Custer reverted to his permanent rank of captain in the 5th Cavalry. He took a leave of absence to consider career options. He pursued an appointment as a general in Benito Juarez's Mexican army, but the US government rejected his request for a leave of absence for political reasons. Upon death of his father-in-law in 1866, he returned to Monroe where he considered running for Congress and joined in the debate on post-war treatment of the South, advocating moderation. After initially turning down rank of full colonel and command of the 10th Cavalry (i.e. the black "Buffalo Soldiers" regiment) he accepted the rank of lieutenant colonel position with the 7th Cavalry regiment at Fort Riley, Kansas. In 1867 he was charged with absence from duty resulting from an unathorized leave to see his wife. His year suspension was cut short by General Sheridan so he could join in the Cheyenne campaign. Custer achieved a startling victory over Chief Black Kettle and the Cheyenne Indians at the Battle of the Washita. It took 2 years recuperation in Kentucky before the 7th Calvary was strong enough to be posted at Fort Lincoln in Dakota Territory in 1873. According to Cheyenne oral history, Custer was joined with Monahsetah, daughter to the Cheyenne chief Little Rock in marriage, the purpose of the ceremony possibly unknown to Custer. While Custer returned with his troops after the conclusion of his battle, Monahsetah bore Custer's son, the only child credited to him. But the child died before reaching adulthood. He was described at this time as tall, slender, energetic, and dashing, with blue eyes and long golden hair and mustache. At the post he wore velveteen uniforms decorated with gold braid, but in the field he affected buckskins. He rarely drank or used tobacco and spent his spare hours reading military history and studying tactics. Custer lead a government expedition with scientists from the Smithsonian Institution in 1874 to investigate rumors of gold in the Black Hills. Those lands were among the territories granted to the Sioux by the Fort Laramie Treaty of 1868. Once confirmed, gold seekers swarmed to the area which caused the Sioux Indians to go on the attack. Custer was to lead the campaign against the Sioux and Cheyenne in early 1876, but was instead summoned to Washington to testify before a congressional committee investigating fraud in the Indian Bureau. Custer's testimony, unfavorable to Secretary of War Belknap, so angered President Grant that he removed Custer from command. 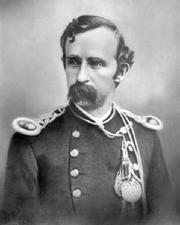 Public outcry and support within the Army, forced Grant to restore Custer to command of the 7th Cavalry. The level of conflict and tension with native Indian tribes continued to rise. To take possession of the Black Hills gold fields and stop continuing attacks on settlers and railroad workers, the government decided to corral all remaining Indians and place them on reservations. The 7th Cavalry departed from Fort Lincoln on May 17, 1876. Their defeat, including Custer's death on June 25, 1876, came at the hands of Lakota Sioux, Northern Cheyenne, and Arapaho Indians. 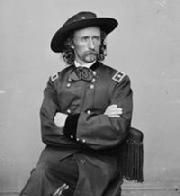 George Custer's distinguished Civil War record has been overshadowed in history by his role and fate in the at the Battle of the Little Bighorn. Controversy still swarms around the command choices he and others made. The battle also ended another potential twist of fate. George Custer, Civil War hero and famous Indian War commander was under active consideration as a Presidential candidate by the Democratic Party, to run against incumbant Rutherford B. Hayes. Following the recovery of his body, he was given a funeral with full military honors with initial burial at the battle's graveyard. His body was recovered in 1877 and reinterred at the US Military Academy at West Point where he is buried next to his wife Elizabeth.